Donald Feinberg was born on 31 December 1962, in New York City, USA, of Jewish descent. 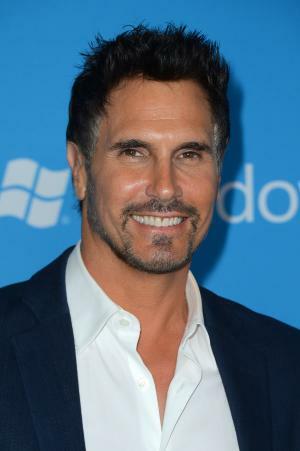 Don is an actor, best known for being a part of the series “The Young and the Restless” as Brad Carlton, and as Bill Spencer, Jr. in “The Bold and the Beautiful”. All of his endeavors have helped put his net worth to where it is today. How rich is Don Diamont? As of mid-2016, sources estimate a net worth that is at $4 million, mostly earned through a successful career as an actor. He was named by People Magazine as one of the “50 Most Beautiful People in the World” during 1990, making him the first daytime actor to be included in the list. As he continues his career, it is expected that his wealth will increase. Diamont started out as a model, and found success with the job for several years. Eventually, he was given a chance to act when he was cast in “Days of Our Lives” during 1984; he played the role of Carlo Forenza and would stay with the show for a year. He was then cast in “The Young and the Restless” as the businessman Brad Carlton, joining the show in 1985 and leaving in 1996. During the peak of his popularity there, he was also part of Sure Ultra Dry’s commercial campaign. He returned to “The Young and the Restless” in 1998 and would remain in that show until his character was killed off in 2009. These contributed significantly to his net worth. He was then selected for the daytime drama “The Bold and the Beautiful” as Bill Spencer, Jr. He first appeared in a May 2009 episode, and has stayed with the series ever since. He’s been praised by the show’s producers, and he now shows intentions of being a script writer for the show, which also continues to boost his net worth. Aside from his various television works, Don is known to be the spokesperson for Morris Home Furnishings. He was also on the cover of Playgirl magazine in 1988 and 1995. In 2006, he was voted as the “Sexiest Soap Hunk of All Time” and three years later, was named the “Sexiest Veteran Soap Actor” by People Magazine. For his personal life, it is known that Diamont married former model Cindy Ambueh in 2012, but and they’ve been together for long time. Prior to this, he dated actress Gloria Loring from 1984 to 1985. He was also married to actress Rachel Braun from 1994 to 2002. He also has a son who plays for the Indiana University football team. He also mentioned that he did not embrace his Jewish for many years, and only accepted it later on in life, in fact using his mother’s maiden name although it is also more rythmical. His role in “The Young and Restless” mirrors his personal life in that his character had to hide his past as being a Jew. Don is also active with the National Multiple Sclerosis Society, and on social media, having more than 10,000 followers on his Twitter site. He also has more than 41,000 followers on Instagram, and he updates both social media pages regularly. 1 He and his often-screen partner Heather Tom both play different characters on The Bold and the Beautiful (1987) than they did on The Young and the Restless (1973). 2 Good friends with Hall-of-Fame shortstop, Cal Ripken, Jr.
3 Was voted No. 1 on the Sexiest Soap Hunks of All Time list at the Shrine to the Soap Hunks, in 2006. 4 Is the spokesperson for Morris Home Furnishings in Dayton, Ohio. 5 Received the Ambassador of the Year Award, in recognition of his efforts on behalf of the National Multiple Sclerosis Society, in 2001. 6 Has four sons with ex-wife Rachel Braun, named Lauren (born 1988), Sasha (born 1991), Alexander (born 1995) and Luca (born 2000). 7 Son of Judy and Albert Feinberg (both are deceased). He has two sisters, named Bette (deceased) and Elena. He also had a brother, Jack, that died in 1990, of brain cancer. 8 Used his mother's maiden name when he started acting and modeling. 9 Supports research for multiple sclerosis. His niece, Alyssa, suffers from it. 10 Hobbies include, basketball and cycling. 12 Engaged to Cindy Ambuehl who gave birth to the couple's twins Anton and Davis in January 2003. The Bold and the Beautiful 2015 TV Series Bill Spencer Jr.